In this and the following post, we will review the different processes involved in producing the star of Spanish cooking. There are several different steps that take place over the course of several months, and that occur between the time when the pig arrives at the slaughterhouse to the moment when the high-quality Iberian ham is finally obtained. 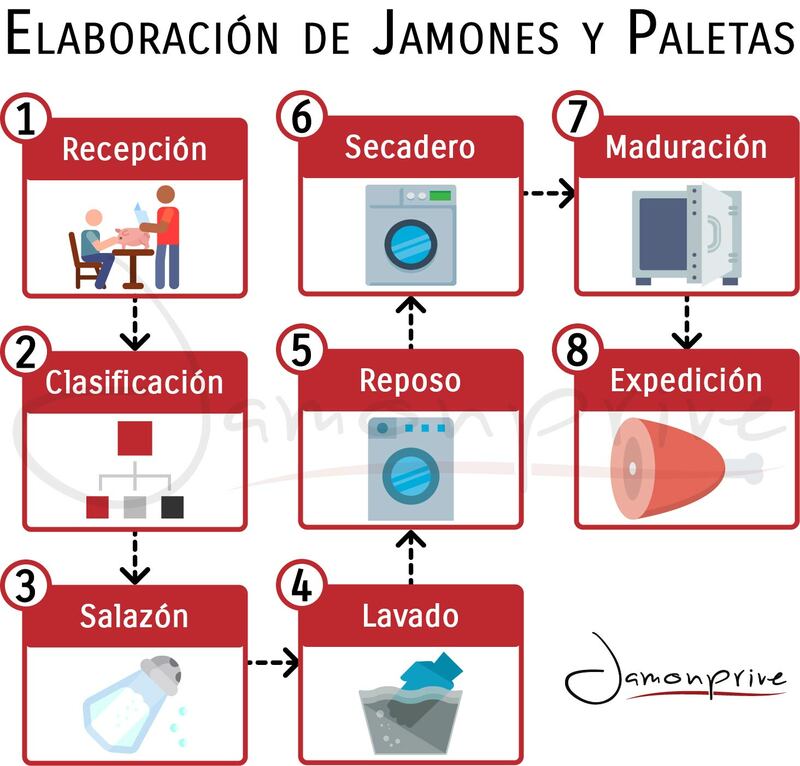 The main stages in the processing of a ham are: salting, washing, post-salting, drying and maturation in the cellar, which are monitored by a ham master in order to guarantee an excellent product that is considered to be a true delicacy around the world. To begin with, the raw material must come from animals that have been declared fit for human consumption. To receive this distinction, the pigs must go through a rigorous sanitary inspection process both when they are alive and after their death. Additionally, care is taken to make sure the pieces are uniform. Now we will proceed to describe the phases that are needed for the ham's transformation and later consumption. The goods that have been previously cut at the slaughterhouse (which must be properly identified by means of a plastic earring/tag according to applicable regulations and traceability protocols, as well as a specific badge if they are protected by a Designation of Origin), are received by the producers in a reception room. The animals must also be slaughtered and handled under conditions that prevent any alterations in the pH of the meat, which should be between 5.2 and 6.2. The transport temperature required by legislation is 7ºC for refrigerated meats and -12ºC for frozen meats. Without breaking the cold chain, the pieces are deposited in a chamber to be stabilised at the same temperature (0 to 3ºC). Then we proceed to shape the piece that will be used to produce the cured ham; this process consists of removing fat and skin with a knife to obtain a product of a certain shape and proportions. 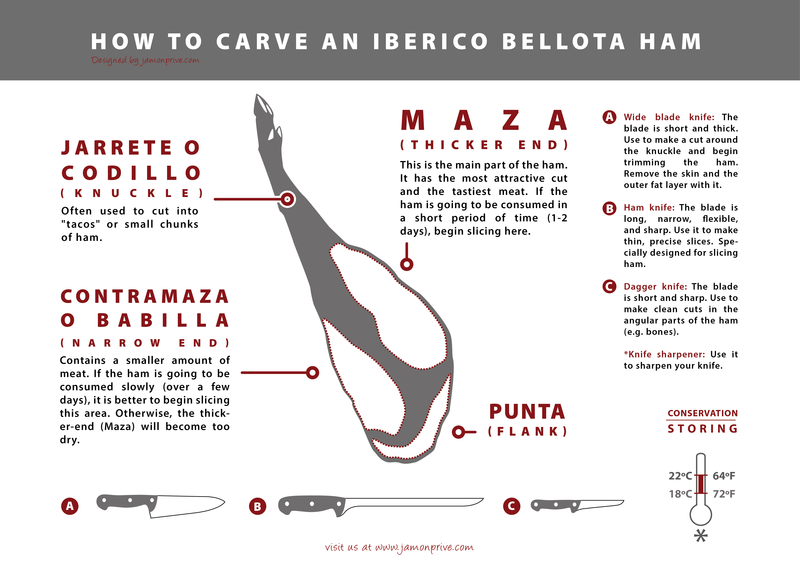 In the case of Iberian ham, a V-shape or "Serrano" cut is made, while in the case of a Huelva shoulder ham, a crescent cut is also allowed. V-Cut: when the skin goes from the elbow to the centre of the ham and forms a V shape. Crescent cut: when the skin is cut into a half-moon shape. Beveled or round cut: when all the skin is left on the piece. The classification of the pieces according to their weight is done with a sorting machine; the pieces are selected to be placed in three or more categories according to their weight in kilograms (kg). The sorting machine consists of a weighing module and a sorting conveyor, with pneumatically operated gates through which the pieces pass until they reach an area where they are grouped based on their weight. This weighing system is made of continuous stainless steel. By means of an electronic control box, the number of pieces and total weight can be obtained by sorting and transport unit. Prior to salting, the piece is sealed with fire on the rind (MAPA seal - Ministry of Agriculture, Fisheries and Food), using three figures to indicate the week and year of entry into salt. Once sealed, the bleeding process is carried out, which consists of manually compressing the femoral artery and saphenous vein to empty all of the blood. In some cases, the piece can be bled using weights or rollers. Salting plays a fundamental role from a hygienic point of view, since the salt acts as a bacteriostatic agent and thus inhibits the proliferation of bacteria inside of the piece. Then the salting process begins. In this phase, the hams are covered with salt to initiate their dehydration and preservation. The objective is to ensure that the salt reaches the centre and is distributed evenly throughout the piece, thus ensuring a high-quality final product. The time and distribution of the salt is done according to the weight of the piece, as well as the breed and feeding of the pig. In general, grain-fed pigs have less fat infiltration and absorb the salt faster than acorn-fed pigs, meaning they need to spend less time in the salting phase. The estimated amount of time is usually 1 day/kg for Iberian ham, and somewhat shorter for grain-fed, white label ham. In this phase, the salt used for Iberian ham is thick sea salt, while fine salt is used for grain-fed ham, in addition to a specific amount of nitrification. The salting is done by stacking the pieces in layers, in containers or on the ground, where the first layer would be salt, the second layer ham, and so on and so forth until you reach a final layer of salt. It is carried out in chambers with a temperature of 3-4ºC, high relative humidity (80-90%) and static cooling in the container system and dynamic cooling or with fans if the hams are on the ground. This process is controlled through the use of a salinometer, which measures salinity. When the marker indicates the optimum point, for example, 75-82 for acorn-fed ham or 86 for Serrano ham, the piece will be ready to move on to the next phase. Once this phase is reached, the shrinkage or loss of liquid is usually 10%. The objective of this phase is to remove the salt from the surface of the ham. Once the salting is complete, the containers are transferred to an area where the salt is separated from the piece; the salt is collected to be reused later on in the salting of other pieces. The salt that is lost through use is renewed with new salt that attaches to the "old" salt, which is analysed every month to check for the absence of pathogens that could be harmful to health. Washing is done mechanically, the piece enters the machine on a belt where the surface salt is removed through the application of pressurised air. Subsequently, the piece receives a bath from hot water jets to then continue towards another machine where it is shaped and lengthened by means of a pressure system that guarantees a better appearance that will be the same for both ham legs and shoulder hams. This shaping is recommended to be done as soon as possible after the washing, since any delay in time risks fracturing the bone and having synovial fluid leak out, which would spoil the quality of the piece. If the salting is done without containers, the washing is done manually with a brush and occasionally with hot water. Once washed, the piece is bled once again and hangs on stainless steel hangers with plastic or rope rings to start the post-salting process. In this stage, the salt is distributed evenly inside of the piece, and the water is slowly and progressively eliminated from the inside out. This process is carried out in a chamber with a relative humidity of 75-80% and an initial temperature of approximately 3ºC, which will gradually increase until reaching 12-16ºC at the end of the stage. These parameters are controlled by a programmed ventilation system, with an optimum power of around 65-75%. An excess of air would accelerate the maturation process, while a deficit of air coupled with very high humidity would cause the appearance of "remelo", which is defined as areas of a pasty consistency with specific odours on the surface of the piece that allow for bacterial growth, in both cases the final quality of the product would be negatively affected. The minimum amount of time spent in this phase is approximately 60 to 90 days, and may even be extended to 120 days; it all depends on the characteristics of the piece, which is mainly determined by its fat content, which is essentially what determines the penetration of the salt. The production process could end in this chamber in what would be called the "complete or artificial drying cycle". On the other hand, in the traditional method, the piece is placed in a chamber and then subjected to a natural drying process for a period of 18 months and then finishes its maturation in the cellar for at least one additional year or year and a half. As an interesting fact, it's at this stage when the piece acquires greater external consistency and when the biochemical processes that are responsible for its aroma and flavour are initiated. In this phase, the product continues to gradually dehydrate and the fat continues "sweating". This process favours the diffusion between the muscle fibres and the consolidation of the piece's aromas. It can be done with equipment that controls temperature and humidity, and even though its use is infrequent, an oven can be used in order to shorten the process (raise the temperature to 30ºC and lower the humidity to 60-65%). In the event that this stage is done naturally, the drying is carried out using natural ventilation that uses a system of adjustable windows as needed and sometimes can be divided up to facilitate air flow. The microclimate is also of vital importance, especially in regards to the Denominations of Origin, since according to product's characteristics, the organoleptic parameters (colour, texture, smell and taste) will be defined that are specific to the product under a certain Denomination of Origin. For example, in Jabugo there are specific thermo-hygrometric conditions that exist (environmental/physical conditions related to temperature, humidity and ventilation), since there is dry cold in winter with low humidity. In addition, in order to facilitate air flow during the drying phase, the pieces are arranged at different heights within the same pallet. The time spent in the natural dryer ranges anywhere between 6 to 8 months, during which the piece sweats and greenish or whitish areas appear on its surface that are the product of the microbial flora that appears during the maturation process. In this last stage, the biochemical processes (proteolysis and lipolysis) are completed, which are responsible for the peculiar flavour and aroma of the product. Both the dryer and the cellar should allow for the execution of all necessary operations, and should have qualified personnel who can control the handling and combination of factors such as microclimate, altitude, humidity, temperature variations and air speed, since the final quality of the product is dependent on them. The piece reaches the cellar with flora (greenish substance) from the dryer, so the first step is to eliminate it by means of an automatic or manual brushing system, and subsequently a film of Iberian lard or oil will be applied, in order to prevent it from being invaded by mites. Once this operation is completed, the piece is hung once again and left to drain until the ageing process is complete, which depending on the type of product, will take nine months or a year in the case of grain-fed pigs, and two years or more in the case of acorn-fed pigs. The approximate amount of time needed to produce an acorn-fed ham is three years, of which one is spent in the dryer and the other two in the cellar. At the end of all these processes, depending on the amount of blood, the piece's weight will be reduced by 33 to 35% on average. Once the maturation phase has ended, the product is finished and can be stored or handled (deboned, sliced or packaged). Before serving the pieces, a tool made of bone or a long piece of sharp wood is used to check the quality of the piece, after which it is weighed, labeled and packed to be transported and sold. 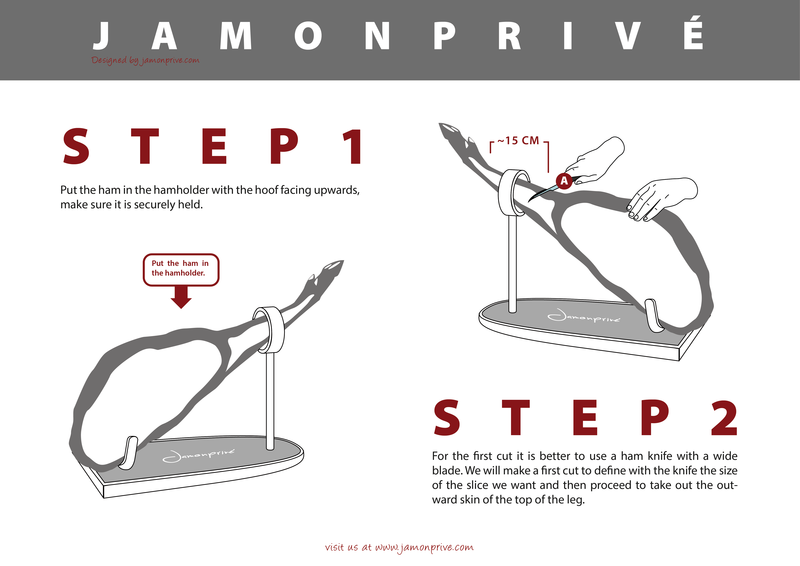 These are all of the different stages that the pieces of ham go through in order to become the world-renowned culinary delicacy that they are, which make our mouths water with their exceptional taste, even more so if we are lucky enough to be trying the best out there: a leg from a pure black Iberian pig. If you've worked up an appetite after reading everything we've discussed, in our online store you can find hams and other products for sale. It's not every day that we get to treat ourselves, so why not start today?